SYN Media was formed in 2000 as a result of a merger between two youth radio projects: 3TD, an AM station run by high school students from Thornbury-Darebin Secondary College, and SRA, the RMIT Student Radio Association that also spawned 3RRR in 1976. The newly created SYN established its home at RMIT University’s City Campus, and the university remains a key partner to this day. In December 2000 the ABA (now ACMA) auctioned a new licence for a commercial FM broadcaster to serve the Melbourne market. The winning bid was $78 million, purchased by DMG, launching Nova 100 the following year. In December 2001, following a competitive bidding process, the ABA awarded SYN a Melbourne-wide FM community radio broadcasting licence to transmit at the same signal power. Given the commercial value of the licence and the strong competition from 26 aspirant broadcasters, this was a monumental achievement for a fledgling organisation. 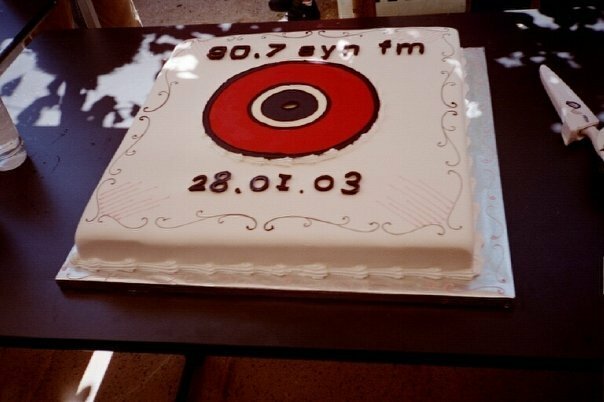 After an intense twelve-month period focused on raising $1 million to purchase and set up the necessary infrastructure, SYN 90.7 FM commenced permanent broadcasting at midday on 28 January, 2003. SYN’s expansion into television followed soon after, with the launch of SYN TV in late 2003. SYN TV was the first program in Australia, commercial or community, to be simulcast on TV, radio and the internet. It was also the first television show to be hosted by young people exclusively under the age of 18. By November 2003 SYN TV was airing in Melbourne, Sydney, Brisbane and Perth and attracting audiences of up to 80,000 viewers in Melbourne alone! SYN’s television department has since produced thousands of hours of live television on Channel 31 Melbourne, including SYN Summer, SYN City, The Sauce, Postcodes, The Naughty Rude Show, The Inquiry, Get Cereal TV and current week-daily music program 1700. Between February 2004 and December 2006, SYN produced a print publication; a zine called Pecado (Spanish for sin). This publication was wound up due to financial resource constraints. SYN has maintained an online presence here at www.syn.org.au from its inception. The launch of this website in early 2010 created a new set of options for our young media makers to produce and publish great media. On April 2nd 2014, SYN officially launched its digital radio station, SYN Nation, alongside a social impact project that would see young people from regional, remote and non-metropolitan Australia produce radio for SYN. SYN Nation currently provides broadcast and training opportunities to over 200 young people outside Melbourne per year, giving young people beyond the suburbs the opportunity to experience SYN as they never have before. In the time since SYN began full-time broadcasting it is estimated that over 12,000 young people have been directly involved in SYN, many of whom have gone on to work in the creative and media industries. SYN has an estimated listening audience of 80,000 people per week (McNair Ingenuity Research, May 2009) and an average of 5000 viewers each time a SYN television program airs on C31 (OzTam, July 2009), it is clear that SYN is resonating strongly with the Melbourne youth community. SYN has won several awards from the Community Broadcasting Association of Australia, including the prestigious Tony Staley Award, for its dedicated service to the youth community of Melbourne. Many of SYN’s education and training programs are utilised by community organisations across Australia. SYN is moving into an exciting future, embracing new technologies, and always staying true to our purpose: creating training and broadcast opportunities for young Australians. Check out our current Strategic Plan and Annual Report for more information on SYN.